This is one of my favorite American muscle cars. The 1970 Plymouth GTX 440 Cid Big Block 7,2 liter is an amazing machine. It has a lot of power and performance and it looks the part, especially with the eye-catching power bulge scoop and the air grabber hood. The design, with its new grille and rear taillights is stunning and the sound is just amazing. It is also a quite a luxury and very comfortable car with many nice standard features. Just take a look at those wheels, the red paintwork, sportive stripes and the nice front with the yellow headlamps. Outstanding build, with all the right parts. The sportive white letter tires and original rims match the GTX perfect. When new it was considered a bargain compared to its competition. 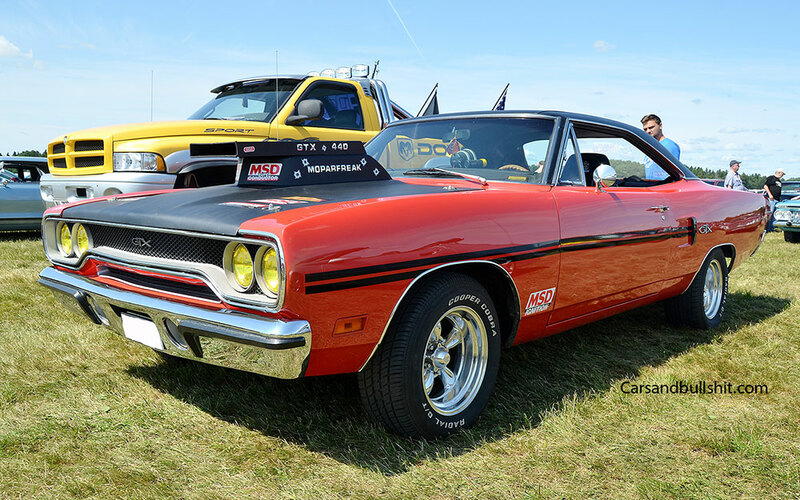 The GTX is one of the most sought after Plymouth models ever produced. This one has the most searched after 440cui Big Block engine with an automatic gearbox and 375 horsepower (on paper and probably more in reality). Performance figures vary but it’s probably safe to say that this car could do 0-100 km/h in 6.5 seconds. The quartermile was done at 14,4 seconds at 99 mph. Very impressive for such a big car. Remember that it is a classic, only 47 years old, and still is faster than many hot hatches. Yes, I want one. Definitely.